as per subject, if I send an email with Evolution or Apple Mail via O365 (both accounts configured with Exchange Web Services, IMAP/SMTP or POP/SMTP have not been tested), GpgOL with Outlook 2013 and 2016 cannot decrypt it. If I send the same email using Outlook 2013 or 2016 using the same O365 account, GpgOL decrypts it properly. I have done some debugging and I can confirm O365 is involved, using another email provider (we recently moved to O365), the problem did not occur. Emails sent from Outlook have a "gpgolXXX.dat" attachment, that is properly read and decrypted by GpgOL, while emails sent from Evolution and Apple Mail have two attachments, one text file with PGP MIME Version (Version: 1) and one with encrypted PGP message. In the attached debug log, you can see starting at 15:23:06 that email message Content-Type is set to "application/ms-tnef", but GpgOL fails to parse message. Last but not least, both Evolution and Apple Mail can decrypt those messages correctly. I can do further testing and debugging if necessary, just let me know. Thanks for your report and analysis. We had a similar problem that we fixed in gpgol 2.0.4 (T3419) that PGP/Inline mails were ms-tnef attachments for some. For you it appears that PGP/MIME mails are part of an ms-tnef attachment. This will need some extra handling. Can you please save such a message in outlook and attach the .msg file here? I don't need to be able to decrypt it but with that I should be able to debug / fix the parser. If you don't want to attach it here you can send it to me privately aheinecke@intevation.de (pubkey 94A5C9A03C2FE5CA3B095D8E1FDF723CF462B6B1 ). You can find the message attached. Message has been saved from Outlook 2013. Thank you. With that message I could reproduce the problem and have a fix. I now get to decryption failed / no secret key as it should be. And confirm that this fixes the problem for you? If that fixes the problem it would also be great if you could test with a signed (not encrypted) mail from the same clients. I made an educated guess how such a mail would look like wrapped in ms-tnef but I'm not sure if that guess is correct ;-). I just tested version 2.0.7-beta8 x64 and I can confirm the bug is fixed, GpgOL can decrypt messages properly. Messages also appear to be properly signed. 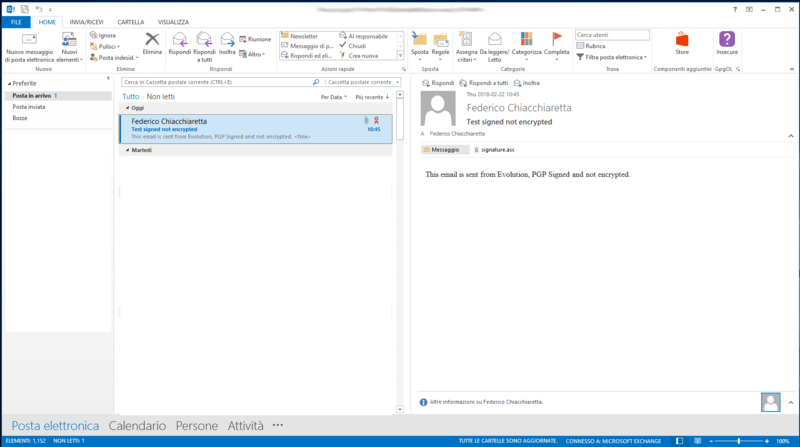 I also did a test with a signed only email, but in this case GpgOL doesn't seem to detect signature properly, Outlook shows an attachment "signature.asc" and message is not tagged as "GpgOL: Trusted Sender Address". You can find a screenshot, .msg and debug log attached, hope it helps. aheinecke added a commit: rO14d0e2d9d1e0: Fix multipart/signed detection if ms-tnef wrapped. Thanks for the test and the example mail. Should also be fixed now. While testing I also noticed that the sender email address was also not parsed correctly for these kind of mails and added some code to fix that. If you like you can grab 2.0.7-beta10 from the same location. I did some tests with 2.0.7-beta10 and still found some issues. The message I attached as a test case in previous comment is now properly handled, I see no "signature.asc" attachment and message is correctly tagged as trusted sender; this test message was sent from Evolution and I sent it to myself (sorry for not pointing this out before). If I try to open a message sent from Apple Mail by a different person, again I see no "signature.asc" attachment, so it has improved, but message is not tagged as trusted sender; messages from the same sender (and same client) were correctly tagged before switching to Office365. From the log I can see that GpgOL picks up the wrong "Sender" address. It thinks that you sent the mail yourself and then the mail address <> signature does not match. So it is not flagged as Trusted. I think I found the bug in our code that caused that. This time I can't give you just an updated GpgOL as there were too many changes so that it can no longer be a drop in replacement. I let you know when I have a new installer. I'll wait for v3.1.0 then. I installed 3.1.0-beta and tested all use cases, everything is working properly now. Thank you for your support and great work! Thanks for your help / report.